Double maturation process, the spirit is moved to quarter sized casks (approximately 125ltr), at about 7 to 8 years old, they are then moved the warehouse right by the bay, the use of the smaller cask size ensures greater contact to the oak, giving a gentler edge to the peatiness, bottled at 48%ABV. 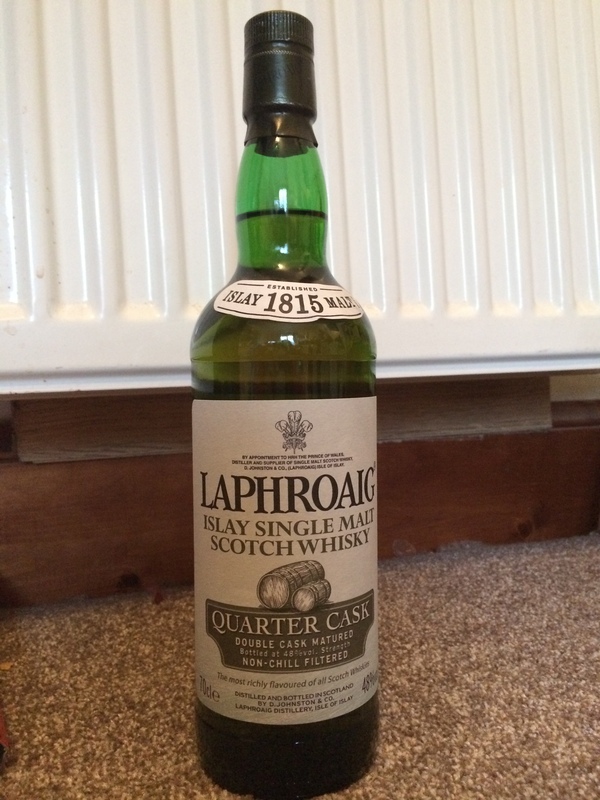 Nose: Gentler smoke on this one, has the distinctive Laphroaig (@laphroaigwhisky) aroma but with a vanilla edge, the oak comes through on the second nose with a velvet softness, before more peat and bonfire ashes come through. Toffee Apples and a slight milk chocolate edge. Palate: initial heat and peat smoke, fading into something softer, wisps of ocean spray, and then the oak. Sweeter vanilla notes as promised on the nose, with sharp apples and then grainy, sugar sand pear, before the peat takes back over. Finish: Long and satisfying, gentle but complex, still evolving a good five minutes later. Nose: Softer than the 10yo, the smokiness and saltiness are still there, however they are a lot more gentle, sea breeze hits at the end just before you are about to taste. Palate: Smoke, smoke everywhere, from the first sip until the glass is empty. Slight fruitiness tempered by the vanilla, which is there in abundance. Then smoke, always smoke. Finish: Everything you would want from a Laphroaig and more, smoke and salt dissipated in equal measure leaving you wanting more.